"Grey's Anatomy" season 13 cast members, execs and staff recently reunited for the first ever script reading session this season. Just recently, executive producer Shonda Rhimes shared a short clip via her Twitter account that showed a large group of individuals gearing up for a script reading session. One of the execs said "Season 13" and everyone started clapping their hands together. Some of the cast members from the hit ABC series that were spotted in the clip include Chandra Wilson, James Pickens Jr., Kelly McCreary and Camilla Luddington. 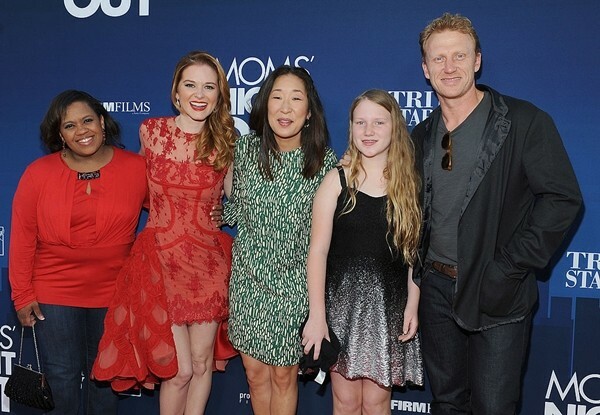 It is believed that all of the main characters from "Grey's Anatomy" were also present at the gathering. Unfortunately, other details from the set of "Grey's Anatomy" season 13 are still being kept under wraps. What is only known is that the official filming day for the show will commence sometime next month. Cast member Camilla Luddington dropped the news after sharing one of her photos during a recent trip to the beach via her Instagram account. At that time, the actress said that being on hiatus has been very fun. "Oh hiatus... You've been so fun. Pssst. 18 days..." she captioned the photo. The actress also hinted that since the time of posting, the filming for "Grey's Anatomy" season 13 will start 18 days later. At that time, some fans also commented on Luddington's post by saying that they can no longer wait for the premiere on "Grey's Anatomy" season 13. Instagram user @jenperry4iu wrote, "Yaaaass!! Cannot wait!! #jowilsonisthebomb." Another fan @xxbtriz wrote, "Hey. I'm so excited #jolex on TV." In other news, "Grey's Anatomy" season 12 ended on a not-so-positive note for Luddington's character Jo and her long-time boyfriend Alex (Justin Chambers). The latter proposed to the former, but she refused. It was later on revealed that she was previously married to a man that physically assaulted her. As of late, there are rumors that Jo's ex-husband may be featured in the show. "Grey's Anatomy" season 13 will premiere on ABC on Sept. 22 at 8 p.m. ET. Oh hiatus.. You've been so fun. Pssst. 18 days..
Grey's Anatomy Spoilers ABC Camilla Luddington James Pickens Jr.
‘Grey's Anatomy' season 13 spoilers: Meredith Grey in danger of being killed off? ‘Grey's Anatomy' star Jesse Williams in danger of being axed from ABC show?